Be the first to share your favorite memory, photo or story of M. Gwynn. This memorial page is dedicated for family, friends and future generations to celebrate the life of their loved one. 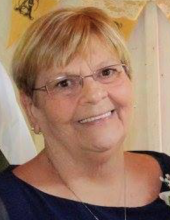 M. Gwynn Reinle, 65, passed away Monday, April 8, 2019 at her home. She was born June 30, 1953 in Louisville, Kentucky the daughter of Elmer Ted and Margaret Glover Reinle. She was a dental assistant. She was preceded in death by her parents and a son Garland P. Abbott, III. She is survived by her husband, Gary Abbott of Elizabeth, IN; daughter, Michelle Walston (Joedy) of Laconia; brother, Chet Reinle of Leitchfield, KY; sister, Teddy Callis of Laconia; two grandchildren, Brett Walston (Jenna) and Reilly Walston and one great grandchildren, Ryan Walston. Funeral services will be held at 1 PM Thursday, April 11, 2019 at Gehlbach & Royse Funeral Home in Corydon, IN. Burial will be in Rose Hill Cemetery in Elizabeth. Visitation will be from 11 AM to 8 PM Wednesday, April 10, 2019 and from 10 AM to 1 PM at the funeral home in Corydon, Indiana. The family suggests memorial gifts be made to Hosparus Health at 502 Hausfeldt Lane New Albany, Indiana 47112. To send flowers or a remembrance gift to the family of M. Gwynn Reinle, please visit our Tribute Store. "Email Address" would like to share the life celebration of M. Gwynn Reinle. Click on the "link" to go to share a favorite memory or leave a condolence message for the family.